Earlier this summer we had a Team Pebbles contest and we made cereal bars. Now it is your turn to pick your side and have a chance to win both the Team Pebbles Sweepstakes and a fun themed Team Pebbles Giveaway from Close to Home. Which side will you choose? The sweepstakes entry period ends September 26, 2014, so enter today! To enter, with parent’s permission, have kids ages 6-18 pick a side (Team Fruity or Team Cocoa) by via www.TeamPebbles.com or via the TeamPebbles App and then navigate to the “Win Prizes” section. Meanwhile you also have a chance to win a fun prize pack from Close to Home. For the giveaway, one winner will get a Team Pebbles kit complete with the following items. Cocoa Pebbles, i love chocolate. Cocoa pebbles of course. I’ve loved them for years! Im rooting for Cocoa Pebbles! Team Cocoa Pebbles! My daughters love both though! 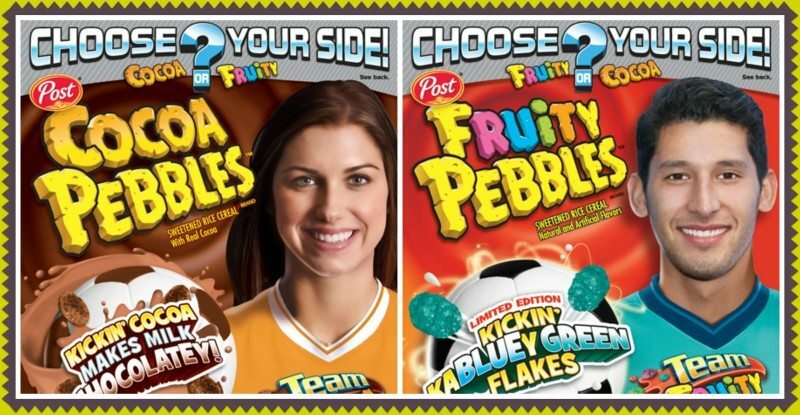 I choose Team Cocoa Pebbles. Thanks my Son is rooting for Team Cocoa!